Providing you the best range of pt-100 temperature controller with effective & timely delivery. 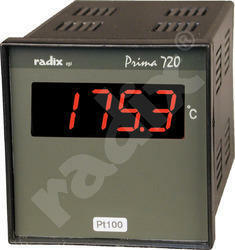 PRIMA 720 is a Digital Temperature Indicator and Controller. Its single input accepts J-type (Iron/Constantan) and K-type (Chromel/Alumel) thermocouples, Pt100 RTD and linear (millivolt or milliamp) input. A large LED display on the front of the unit indicates the process value. This is a highly accurate indicator, with an error as low as 0.1% for linear inputs and no more than 1% for thermocouples. It also retransmits a 4-20 mA output signal to other devices such as a Programmable Logic Controller (PLC) or Solid-State Relay (SSR). By including input terminals in the excitation loop, PRIMA 720 provides a power supply for two-wire 4-20 transmitters. The indicator’s modular design has zero-wiring making it virtually shockproof. Looking for Special Products ?